Social media is used by campaign groups to get their message across during the lead up to both elections and referendums. Social media is used by campaign groups to get their message across during the lead up to both elections and referendums. Bond et al. (2012) showed in a study of 61 million users in the 2010 US congressional elections how facebook posts ‘directly influenced political self-expression’. Human behaviour is thought to spread through face-to-face social networks, but it is difficult to identify social influence effects in observational studies, and it is unknown whether online social networks operate in the same way. Here we report results from a randomised controlled trial of political mobilisation messages delivered to 61 million Facebook users during the 2010 US Congressional election. Twitter in particular has been described as a tool that campaigners and politicians can use to shape media and public perception (Conway et al 2015). Forums such as Twitter allow voters to participate in debate. It allows discussion, idea challenging and information exchange and allows the public to become engaged in the process. Questions exist over the extent to which social media content may bypass, follow, or attract the attention of traditional media. This study sheds light on such dynamics by examining intermedia agenda-setting effects among the Twitter feeds of the 2012 presidential primary candidates, Twitter feeds of the Republican and Democratic parties, and articles published in the nation’s top newspapers. Daily issue frequencies within media were analyzed using time series analysis. A symbiotic relationship was found between agendas in Twitter posts and traditional news, with varying levels of intensity and differential time lags by issue. While traditional media follow candidates on certain topics, on others they are able to predict the political agenda on Twitter. In the referendum on Scottish independence several studies were conducted including the one, published in the Guardian, that used Twitter to analysis the level of discussion on different topics associated with the referendum. This highlighted the issues that were important to the (Twitter) public and how the campaign groups interacted with them on those topics. In this study they note how the campaigns were out of touch with the breath of discussion taking place. Scottish Independence: Which Issues Have Led the Twitter Debate in 2014? A study by researchers at the University of Glasgow has analysed Tweets that use the #indyref hashtag. Over time, the currency emerges as the most mentioned topic of discussion but oil, the EU and taxation have also been frequent matters of debate. Topical events and policy announcements drive discussion at specific moments, leading to large spikes. It must be remembered that observations of what happens in social media only represents the discussion that is taking place in social media. This can be a very bias sample – this is discussed further by Quinlan et al (2015). Great care must be taken to not extrapolate this directly to society at large. Online Discussion and the 2014 Scottish Independence Referendum: Flaming Keyboards or Forums for Deliberation? Referendums often fail to live up to a deliberative standard, with many characterised by low levels of knowledge, disinterest and misinformation, negativity and a focus on extraneous issues to which voters are voting. Social media offers new avenues for referendums to incorporate a greater deliberative dimension. In a previous storify we looked at the hashtags from the EU leave and remain camps. This time we have are looking at a more extensive analysis of the tweets from the official Twitter accounts of the campaigns @vote_leave, @StrongerIn and @LeaveEUOfficial. This is intended to be an initial exploration of their use of Twitter and a comparison between the accounts. We can see from the total number of tweets graph below that there is a large difference in the number of tweets sent by each group. With both leave groups tweeting more than the @StongerIn campaign. @StrongerIn started tweeting on the 18th September 2015, it has 6,073 followers and has tweeted 112 times. @LeaveEUOfficial started on 11th July 2015, has 31.6K followers and has tweeted 990 times, @vote_leave started on 8th October 2015, has 7,402 followers and has tweeted 629 times. These figures include the times they retweet tweets from others but not the times they are retweeted themselves. We can see that @LeaveEUOfficial is the most established account and has tweeted the most and has the most followers. The tweeting activity from this account is very consistent with tweets most days – usually between 8-20 tweets per day. Very occasionally they will tweet a lot more for example they tweeted 38 times on 18th November. @vote_leave are far less established but have generally tweeted more per day than the other two accounts. They tend to cluster tweet – so they will tweet a lot for a few days then go quiet. Their biggest tweet day was the 12th October with 42 tweets. 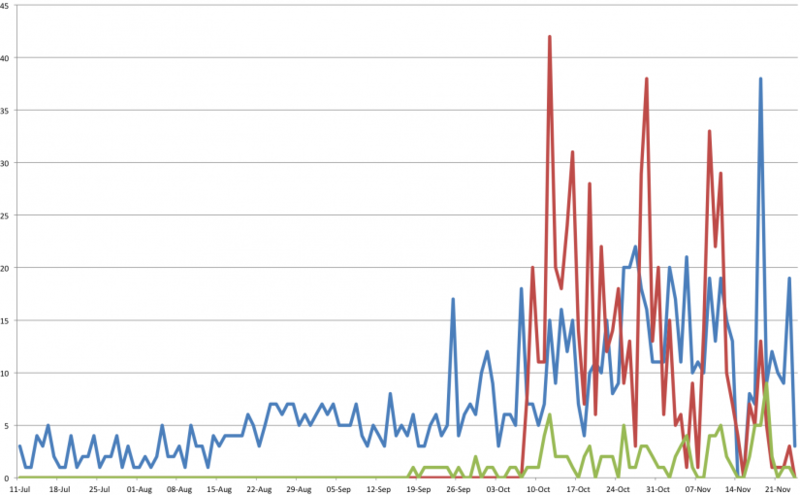 @StrongerIn tweets consistently but at a lower volume – usually between 1-4 tweets a day. Their highest tweet day was 19th November with 9 tweets. It is likely that the campaigns aim to reach people through social media. This means as many people as possible reading the tweets. Tweets are either read on a time line by followers of an account, read by the followers of others when they are retweeted or read when users search twitter either using search words or hashtags. To improve your reach therefore the aim is to recruit more followers or to be retweeted as widely as possible. We know that the @LeaveOfficialEU has many more followers than either of the other accounts so has a larger reach than the other two accounts. With this in mind we look at the approaches and strategies taken by the three accounts. When the groups tweet they differ in how they structure their content and what extra media they include. Tweets tend to get retweeted if they contain images, they are more discoverable (through searching) if they contain hashtags (#) and they can be targeted to certain individuals (generally with the hope of a retweet) if they contain a mention (@). We can, to a certain extent, measure the success of a tweet by the number of times it is retweeted and the number of times it is favourited. We can see @LeaveEUOfficial on average per tweet gets both more retweets and favourites. They are followed in quantity of both retweets and favourites by @StrongerIn then @vote_leave. There is a smaller difference in number of favourites than retweets between @vote_leave and @StrongerIn. @StrongerIn tend to use more mentions and images per tweet than the other accounts – this may be increasing the success of the tweets and making up, to some extent, for their lower number of followers. As discussed in a previous post @StrongerIn uses less hashtags than the other accounts – it is possible that the later start date, and the lower volume of tweets may account for the smaller number of followers. We can look at the types of users the accounts are trying to reach by analysing those that they mention in their tweets. In the graphs below we see the most frequent 10 (or less if not available) user accounts mentioned. We can see that the @StrongerIn campaign often mentions members of its own organisation such as Will Straw, Lucy Thomas, and Karren Brady or known remain supporters such as Patrick McFadden – who are presumably more likely to be positive towards their message and retweet. They also mention Megan Dunn President of the National Union of Student – this may be a strategy to reach students and therefore court the youth vote. They also reach out to the vote_leave campaign through mentions of Dominic Cummings (@odysseanproject) and @vote_leave. This could be trying to reach those supportive of the leave campaigns and challenge their beliefs. You can see in the graph above that @LeaveEUOfficial is reaching out to main stream media by mentioning news outlets – the Telegraph, Daily Express, Guardian and New Statesman. These accounts have a lot of followers so a retweet from one of these accounts would have a large reach. They also mention @TheKnow_EU which was an account for@LeaveEUOfficial – presumably to make sure followers switched over from the old account. They also mention supporters of their view such as Andy Wigmore, Robert Kimbell (@RedHotSquirrel) and Nigel Farage in a manner similar to @StrongerIn. @vote_leave reach out / challenge the @StrongerIn campaign through mentions of Lucy Thomas, StrongerIn and @euromove – a grass roots group. They show that they are campaigning on a business platform by mentioning the CBI, the BNE and Roland Rudd. They also mention the politicians David Cameron and George Osborne this could be a strategy either to influence those politicians directly or to influence their followers. We then look at the types of topics discussed in the text of the tweets by looking at commonly used hashtags (the graphs above). @LeaveEuOfficial use hashtags to position themselves. They classify their tweets with hashtags in the same way a librarian would classify a book with specific terms. These hashtags provide a level of context about their position in the discussion in a very small number of characters. They use the hashtags such as #euref, #eu and #uk to frame the debate and establish what they are talking about. They use #leaveEU, #theknow and #brexit to establish a pro-leave direction. Interestingly they also use #justsaying and #justsayin with high frequency. We can see how how the urban dictionary defines that hashtag below. @vote_leave uses #voteleave, #brexit and #eu in a similar way to @LeaveEUOfficial, they also use #EUCO in the same way. They use hashtags to interact with and/or criticise the CBI with #cbi2015 and #dodgyCBI this again shows that they are aiming to campaign on a business platform. We can also see that they use specific hashtags to point at a certain issues, for example to criticise David Cameron’s appearances at a European summit they use #theinvisibleman. They often use the catchphrase ‘wrongthenwrongnow’ as a hashtag. @StrongerIn do not use many hashtags. They use them for positioning in the debate #eu, #euref. They also used #modi and #modiintheuk to highlight the Indian Prime Minister’s support for the the UK remaining in Europe. As not all groups use hashtags to the same degree we also analyse the text from the tweets. Below we can see word clouds from each of the accounts showing the frequency of hashtags, individual words and two word terms. Commonly used words (like ‘and’ or ‘the’ ) have been removed. We can see that because @LeaveEUOfficial use many hashtags in their tweets the hashtag cloud is similar to both the frequent word and two word term clouds. The @StrongerIn clouds indicate a focus on the economy and what is provided by the EU (‘EU provides’). The @vote_leave word and two word clouds again strongly reflect the hashtag cloud. The two word cloud shows how this campaign discussed (and criticised) the BSE (Britain Stronger in Europe) launch. For some reason this isn’t something they used hashtags to provide a context for – possibly there was no hashtag used by others in referring to the launch. You can see in their two word cloud that there is a message in their campaign urging voters to take control – in the use of both ‘voteleave takecontrol’ and ‘takecontrol eu’. This initial study shows us that all three groups use Twitter in very different ways. Currently @LeaveEUOffical has a stronger reach – it has more followers, retweets and favourites. It uses traditional media through mentions to extend that reach. @StrongerIn tweets consistently but at a lower rate and attempts to increase its reach by the use of images. Both @StrongerIn and @vote_leave challenge each other and each others supporters directly. @vote_leave tweet in a clustered manner and react quickly to current events. We will continue to study these approaches as the campaigns continue and see if any of theses strategies change as the referendum draws nearer. This is written as part of the #ImagineEurope project. The project is part of the Economic and Social Research Council’s UK in a Changing Europe programme. Look out for our regular updates as the project tracks developments in the debate on the UK’s continued membership of the EU and follow us @myimageoftheEU on twitter.